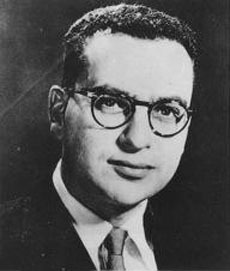 American theoretical physicist Murray Gell-Mann developed the concept of strangeness for particles in 1953, explaining with a quantum number why some hadrons decay rapidly by the strong nuclear force while others decay more slowly by the weak force, contrary to previous theories. This curious difference in decay rates amounts to about one hundred-millionth of a second. In 1961 he proposed the Eightfold way, a new classification system for baryons (heavy subatomic particles) to explain the almost infinitely complex kinds of particles in collisions involving atomic nuclei. In 1964 he discovered the quark, omega-minus particles believed to be fundamental building blocks of neutrons, protons, and matter itself. This discovery strengthened evidence for the Eightfold Way, brought that theory into widespread acceptance, and brought Gell-Mann the Nobel Prize for Physics in 1969. He has said that the word quark was borrowed from James Joyce in Finnegans Wake. His discovery of the quark was concurrent but independent of the work of George Zweig (1937-), and his elucidation of the Eightfold way was also explained independently by Yuval Ne'eman (1925-2006). As a young man he studied under Robert Oppenheimer and Enrico Fermi. At CalTech he worked down the hall from Richard Feynman and arguably made greater contributions to physics, as their early friendship faded to frustration and a feud (at least on Gell-Mann's part) by the 1980s. In 1984 he was a co-founder of the Santa Fe Institute, a center for theoretical research.